1 2 3 4 5 6 7 8 9 10 11 12 13 14 Clark, E. Culpepper. "The Schoolhouse Door". Oxford University Press, 1993, pp. 175-176, 225-228. 1 2 3 4 5 6 Martin, Douglas (October 14, 1995). 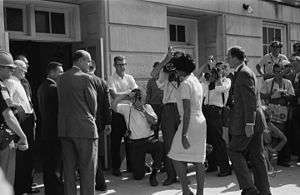 "Vivian Malone Jones, 63, Dies; First Black Graduate of University of Alabama". New York Times. Retrieved March 8, 2013. ↑ Bledsoe, Christena. "Vivian Malone Jones and the VEP: From Integration to Voter Registration". Retrieved March 9, 2013. .
↑ "Alabama Department of Archives and History, Governor George C. Wallace's School House Door Speech". Retrieved March 9, 2013.